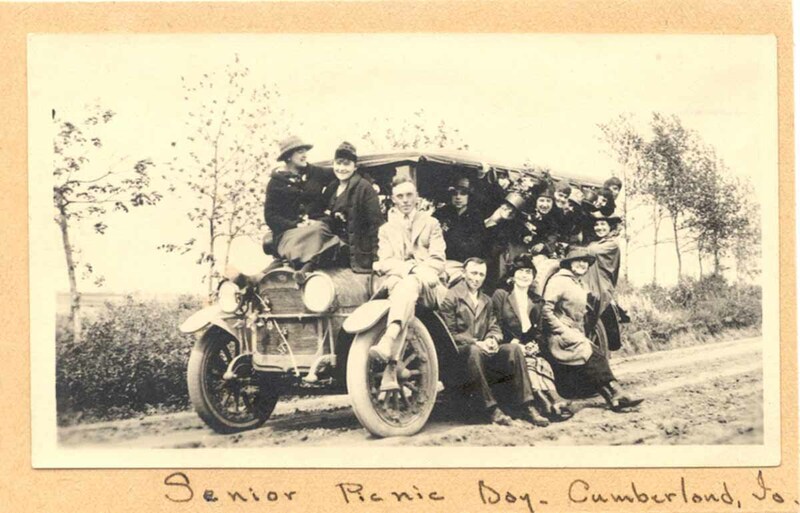 This photo is labelled "Senior Picnic Day, Cumberland, Ia" without any further identification. Possibly circa 1910? It was pasted onto a scrapbook album page, and a small scrap of a newspaper clipping tucked in with it appears to be a marriage notice for E. J. Colberg and ? ?, indicating the "couple will return to Omaha for a visit before they sail on July 8 for England, where they will make their home. Colberg is assistant traffic manager for Armour and Co., with headquarters in London, England. He met his fiancee several years ago at Nicholas . . ." A partial address on the back of the photo (rightmost portion is cut off) begins "E. J. Co". Please contact Cheryl Siebrass, Cass County Coordinator if you can provide further info or identify any of the individuals in the photo. Photo contributed by Cheryl Siebrass. September 2010.